Quinn is 10 weeks old today and I've loved this past week with her, her development has suddenly sped up and we're moving out of that one sided newborn stage where you seem to give, give, give to your baby and get nothing in return. She's now a regular smiler, a screecher, and chatterbox. She's well and truly fed up with laying in the carrycot of her pram and goes in the Cybex My.Go carrier on almost every outing. Now that she can hold her head up on her own, I've done away with the head support and she can now look about all over the place very confidently, so that's her favourite thing to do! Whilst she can't grasp anything, she's trying, and is swiping her hand at toys (or my face) in front of her in an attempt to touch them. She's also developed an awareness and interest in the cat (just the one, The Kitten doesn't go near her!) and this week alone she's had huge gummy grins for two of her three brothers, Daddy, and even Grandma - who she doesn't get to see as often as either would like. I bought Quinn a bath seat this week as she's only ever had baths with me up until now. With the seat, she and Seb shared their first bath - and both loved it! I'm using Moogoo Mini Moo Bubbly Wash for their bubble bath, and washing Quinn with an organic cotton flannel and Baby Top To Toe Wash, both from Natalia by Vital Touch - I'll review both products in separate posts soon. 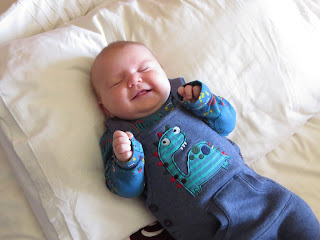 I took both little people at the weekend and hit the sales to get Quinn some 3-6 month clothes. I did end up buying more from the boy's sections than girl's though - as a rule I'm really uninspired by the baby girl's clothes in shops! Here's one of her adorable new outfits! It's from Tu at Sainsbury's.